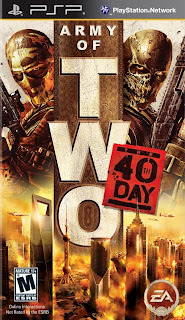 Coinciding with the launch of Army of Two: The 40th Day for the consoles was the release of the same title for the Sony PSP. Although they share the same title, the gameplay was entirely different. For the consoles, generally the game was played as a 3rd person shooter similar with Gears of War mechanics, but for the PSP, this game played more as a top down shooter, perhaps akin to something like Smash TV or the downloadable title, Zombie Apocalypse. In this game, you play as Salem or Rios (an AI player will take control of the other) as you infiltrate terrorist operations in Shanghai. Onscreen, the game is beautifully designed with nice detailing done on each of the stages. The game also incorporates comic book style in-game cut scenes which were welcomed. The voice work is also good. That's about all the good in the game. This game was crap. So many technical gaffs kept this game from being any good. The first thing that's wrong with it is its control scheme. To move your character you use the analog stick (on the left) and to issue commands to your AI teammate, you use the direction pad (also on the left). To fire your gun is the most ridiculous thing, you use all 4 buttons of the button pad, with each button corresponding to its associated direction. So basically, you could only fire in 4 directions. 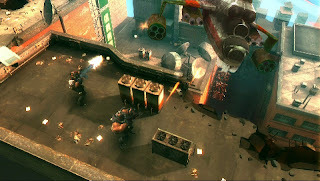 However, the system tries for a smart fire mechanic, locking you on to the closest enemy in that particular direction, even if they are diagonal from you. Unfortunately, it doesn't always work, and you end up firing at the air instead of the enemy. All this would have been averted if the PSP just had a second analog stick. The second biggest gaff is the AI partner. Sometimes he can be completely unresponsive. There are battles where working in tandem is key to winning, but the AI will just stand and refuse to do anything. Aside from combat, there are times where he just won't follow you. The game feels so dead at times because of this. I mean, it's called Army of Two, not Army of You. Oh, I need to trademark that. I feel bad for the PSP. It's such a strong system technically, but the industry seems to give it the shaft. Games like this really don't help either. Until next time, later geeks!